Collaborating on creating eLearning content for your business can be tricky. Not everyone can work on the project at the same time or even the same place. There are many different Project Management platforms out there, the one we chose to use is Google Drive. Google Drive is cloud based storage where you can keep photos, videos, presentations, and PDFs. Google offers a free account which allows you to store up to 15GB, if you need more storage they also have packages you can purchase. When creating files, they are private until you share them. When sharing the files, you can let the person edit, view, or just comment on the document. This can be very helpful when you have two authors collaborating but are not under the same roof, this eliminates the chance of losing your USB drive and having to email the document back and forth. You can log into any device and have access to your documents, no need to worry about bringing your work computer home for the weekend. Having a project management platform allows you to keep all of your content in one place, if you know where all of your content is the more likely you are going to use it. 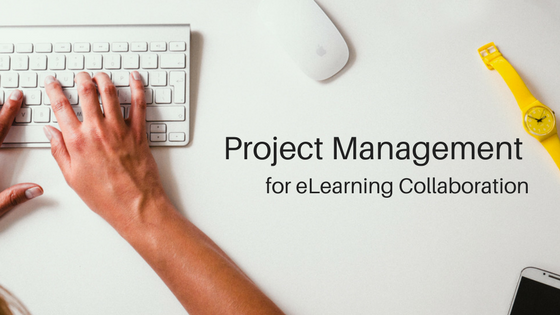 Find a project management tool or give Google Drive a shot. Once you are able to sincerely collaborate with team members and know where your documents are the more you are going to succeed when creating your courses. To learn more about Google Drive click here, https://www.google.com/drive/.